Dec. 1, 2012 -- Albert Romero was one of the top-ranked Mexican boxers when he competed in the 1932 Olympic Games in Los Angeles, a local boy who was a clear favorite to win a medal. But his Olympic career was over in less than three minutes when he was disqualified in his first fight on a controversial call. Romero turned professional immediately after the Olympics, but his seven-year career in the ring was always clouded with the question of what might have been. What if Romero hadn't been disqualified at the Olympics for a punch the judges called a low blow, but what many witnesses described as a legitimate knock-down punch? What if he hadn't injured his hand while training for a fight that could have given him a shot at the world middleweight champion? The question was never whether Romero was a talented boxer and a powerful puncher. He was. But he was also often described as "brilliant, but inconsistent." "Romero’s chief trouble," according to one sports columnist, "is that he only fights as well as he wants to instead of as well as he can." "He fights like a champ when he's in condition, and like a tramp when he isn't," said another sportswriter. "Al has the knack of winning when he's expected to lose, and losing when he's expected to win." After a lackluster showing in one of his fights in the middle of his professional career, the California Boxing Commission suspended Romero for not giving his best effort, and Romero spent the next year fighting in Australia. Romero was born in California on Sept. 6, 1911, the eldest of three children of Fernando Romero, 20, a Mexican-born farm worker, and his 18-year-old wife, Mary Ybarra Romero. Not much is known about Romero's early life, although he did work with his father on the farm. 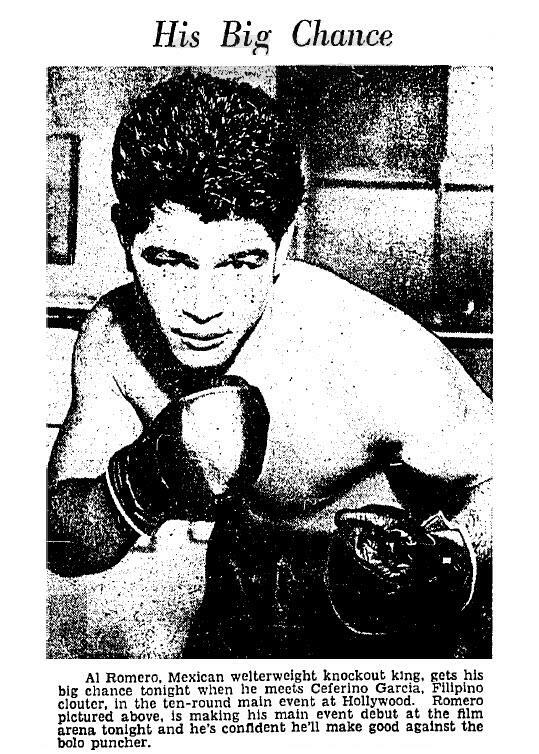 As a teenager, he trained at the Los Angeles Newsboy Club, and earned a spot representing Mexico on the 1932 Olympic boxing team in the welterweight division. Romero faced Dave McCleave of Great Britain in his first Olympic fight on Aug. 10, 1932, in the Olympic Auditorium. Romero had knocked McCleave down four times in the fight when referee Charles J. Mabbutt went to Romero's corner between rounds to warn him about low blows. "The blows I complained of landed on the hip bones and did no damage," Mabbutt said. "So I advised Romero inasmuch as he was winning the bout easily to keep his punches up." The next time McCleave went down -- his fifth trip to the canvas in the three-round fight -- his corner claimed it was another low blow, and the ringside boxing judges agreed. "I did not see the foul punch when it landed," Mabbutt said. "I was behind the fighters, but Judge (Leonhard) Mandlar called it immediately, and all the members of the jury were of the same opinion." Since Romero had already been warned about low blows, he was disqualified and McCleave was awarded the victory. Officially, McCleave won the fight while he was sprawled face down on the canvas. The foul call was questioned by reporters at the scene, and Mexico formally appealed the decision against Romero, but the appeal was denied. The gold medal in the welterweight class in 1932 went to Eddie Flynn of the United States. (It would be 20 years before another U.S. boxer won Olympic gold, when five U.S. boxers, including future world champion Floyd Patterson and "Big Ed" Sanders, took home gold medals from the 1952 Olympic Games in Helsinki, Finland.) Erich Campe of Germany won the silver medal, and Bruno Ahlberg of Finland took home the bronze medal. McCleave finished fourth. After the Olympics, a Los Angeles Times reporter described the top memories of the Games, which included the sight of "Dave McCleave, British boxer, howling like a Halloween hoot owl, claiming a foul in his bout with Al Romero." Even with his defeat and disqualification, Romero was still later described as "the outstanding boxer of the Olympic Games." Less than an hour after the McCleave fight, Romero signed his first professional contract, and made his professional debut on Aug. 30, 1932, at the Olympic Auditorium in Los Angeles -- the same ring where he lost his first and only Olympic fight. This time, however, Romero won, beating veteran boxer Herman Rittenhouse on points. 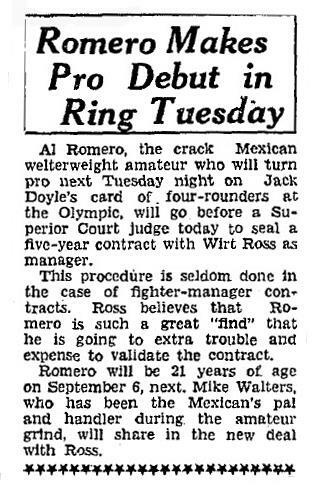 Romero fought and won three more times at the Olympic Auditorium in the next two months, beating Eddie Squillante (a third-round TKO), Bud Atkins and Walter Balcz. Eight days after beating Balcz, Romero fought in San Francisco and suffered his first professional defeat, losing on points to Benny Marquez. On Dec. 27, 1932, 21-year-old Romero returned to the Olympic Auditorium, and faced his first big professional challenge -- 19-year-old Billy Hogan of New York, a former grocery clerk who was undefeated in 10 professional fights. Before turning pro, Hogan had won four lightweight amateur titles on the East Coast, and was being groomed for a spot on the U.S. Olympic boxing team. But before the Olympic Games, the teenager's weight increased from 135 pounds to 140 pounds, moving him out of the lightweight class. (One boxing writer predicted that Hogan could become a heavyweight, "before he quits filling out.") Hogan's manager, Gus Wilson, decided to forget about the Olympics, and get Hogan ready for his professional career. Romero came out quickly against Hogan and won the first round, with Hogan recovering and winning the second. "Romero had things all his own way in the third," according to a report in the Los Angeles Times. "Hogan received a bad beating in the face and on his body. Young Hogan had plenty left for the final round, however, and drove Romero all over the ring to earn the draw decision. The fight was full of action and pleased the fans." Romero went undefeated in 10 fights in 1933, with nine wins -- including two knock-outs and two TKOs -- and one draw. At least that's his record according to the BoxRec.com website. Reading through newspaper archives of that time period show that Romero fought several fights that aren't listed in the "official" record, so his actual professional record might never be known. 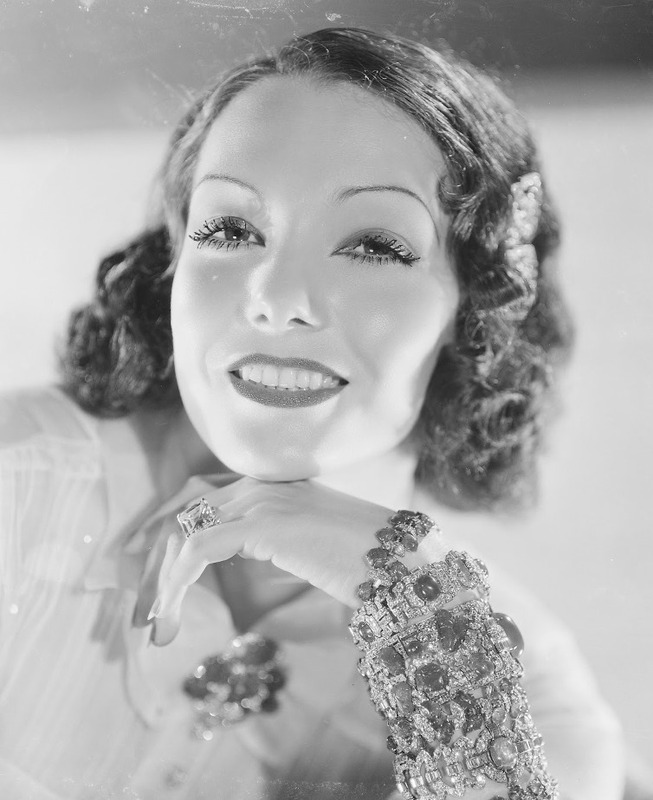 Though born in California and fighting often in the Los Angeles area, Romero was extremely popular among the Mexican population of Los Angeles, including Mexican-born actress Lupe Velez, who was a rabid boxing fan. On March 29, 1934, Romero beat Johnny Martinez at Legion Stadium in Hollywood with a TKO in the second round. "(Referee Charley) Randolph stopped the gory proceedings in the second heat," according to the Times report. "Martinez was on the canvas three times in the first and twice in the second before Romero's hand was raised." But the newspaper reports aren't always reliable, either. Before Romero's April 13, 1934, fight against Billy Boggs of Honolulu, the Times reported that Romero was "unbeaten in pro competition since the Olympic Games," even though, according to BoxRec.com, Romero had a record of 15 wins, two losses and two draws. 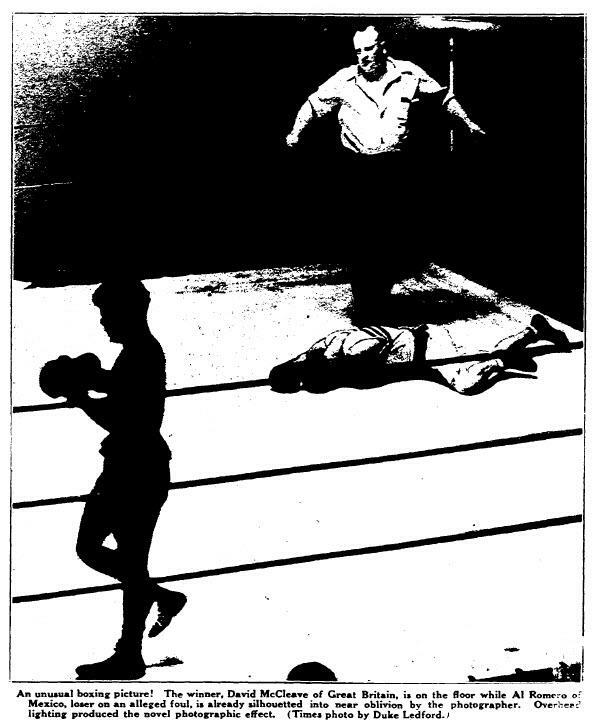 As with all his fights up to this point, Romero's fight against Boggs at Legion Stadium wasn't the main event on the evening's boxing schedule, but it was usually the most interesting and dramatic. This time, Romero was knocked down 10 times in the four-round fight, but still beat Boggs in what was called "as bruising and spectacular a battle as had ever been enacted in a Legion ring." "Romero was caught with a terrific right hand to the chin in the second round, hitting the deck for the first of his nine excursions to the canvas in this round," according to the Times report. "Romero bobbed up four times without taking a count. Most of his trips to the floor were the result of half-pushes and shoves. Near the end of the second session, Romero caught Boggs with right hands that sent the Honoluluan to the floor twice. "In the third, Boggs again dropped Romero for a nine count. The Mexican got up and furiously beat a tattoo on his foe, Boggs finally wilting and hitting the boards for a nine toll. In the fourth, Romero dealt out a merciless two-fisted attack and had Boggs out on his feet." After the Boggs fight, Romero took seven months off -- his longest time out of the ring since the start of his professional career -- then won his next six fights, including three by knock-out. At this point -- according to BoxRec.com, anyway -- Romero's record was 22 wins, two losses and two draws. In late March 1935, three days after beating Baby Joe Gans at the Olympic Auditorium, Romero was fighting again, against Rudy Mendez at the Legion Stadium. Romero was leading all the way and cruising to another victory when Mendez accidentally head-butted Romero in the fourth round, opening a deep gash over his right eye. 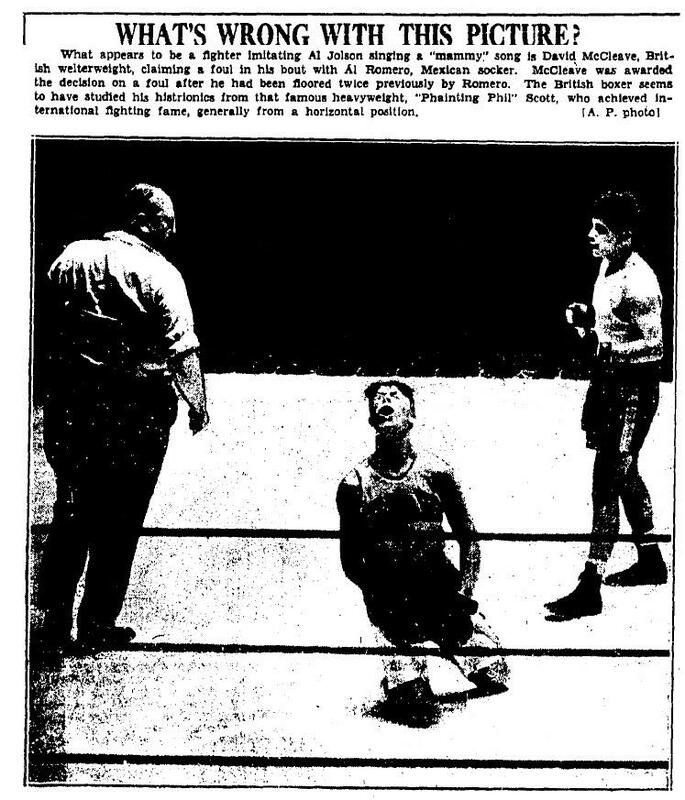 Referee Mushy Callahan stopped the fight, and Mendez won with a TKO -- a decision, according to the Times, which "did not meet with the approval of the fans." 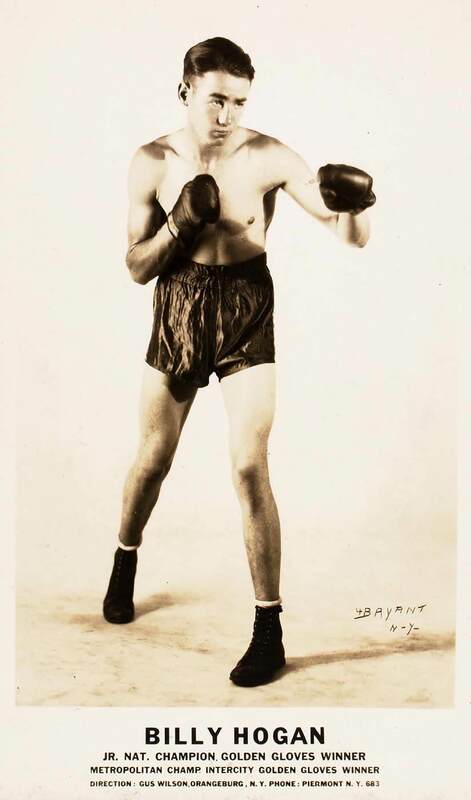 After fighting Lee Wright to a draw on April 12, 1935, Romero entered the ring on May 10 against Teddy DeFrancis, and knocked him out in the second round. The fight was the last of DeFrancis' career, which ended with a record of 19 wins, nine losses and six draws. Romero finally got his chance to fight in the main event when he took on Ceferino Garcia of the Phillipines and his underhanded "bolo punch" at Legion Stadium for the California welterweight championship on June 21, 1935. Although Garcia was the more experienced fighter, with a record of 71-19-9, both Romero and Garcia were known as powerful punchers who had both won a majority of their amateur and professional fights by knock-outs. The fight quickly sold out at the 5,000-seat Legion Stadium, and promoters said they could have sold twice as many tickets to see the popular Romero fight for the state title. But Garcia successfully defended his state welterweight crown, dropping Romero in a 10-round decision. "The fight started very slowly, largely because Romero refused to lead and Garcia took three of the first four rounds, with the second even," according to the Times report. "After a warning from the referee, Romero finally decided to do some fighting and took the fifth and eighth rounds. Garcia opened up with a terrific two-handed attack in the ninth and had Romero on his way out, but couldn’t finish him." Garcia won six rounds, Romero won two, and two were declared even. Romero's next fight was another headline bout at the Legion Stadium on Aug. 16, 1935, against Al Manfredo, who had a record of 49-3-4, including a recent win over Garcia, the boxer who had just beaten Romero. Manfredo was considered more of a pure boxer, while Romero was a powerful puncher. If Romero was going to win, it would have to be by a knock-out. Just before Romero and Manfredo entered the ring, actor Joe E. Brown entered to pay tribute to humorist Will Rogers, who had died in a plane crash the day before. "When Brown finished," according to the Times, "all the stars at ringside had their handkerchiefs to their eyes. There wasn’t a dry eye in the house." When the fight started, Manfredo controlled the action, not letting Romero get too close with his powerful right hand. Manfredo won seven of 10 rounds, and took the decision against Romero. 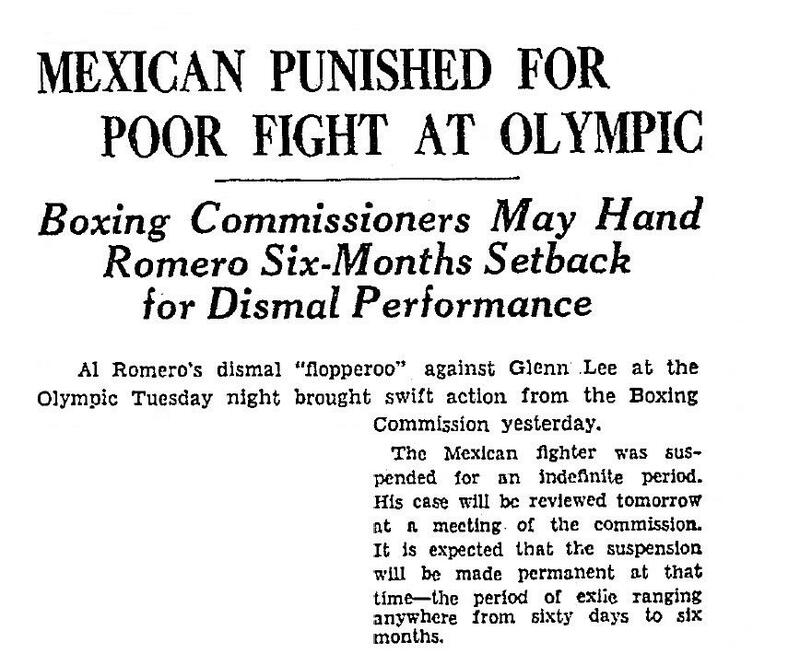 Romero returned to the ring on Jan. 21, 1936, against Leon Zorrita of Cuba, who had a record of 25-1-1. Despite his record, Zorrita was only a slight favorite going into the fight. But Romero was up to the challenge, knocking Zorrita down in the second round, and again in the 10th, when he dropped Zorrita with a stinging left hook. Zorrita got to one knee by the count of six, and was able to stand before he was counted out. Romero then pinned Zorrita against the ropes and pounded away until Zorrita’s corner threw a towel into the ring, stopping the fight. Romero next fought Glen Lee of Nebraska, who had a professional record of 23-4-2. Romero, who sparred with Lee in preparation for his fight against Zorrita, was a slight favorite going into the fight. A victory, Romero’s backers said, would be a key step toward Romero fighting again for the state welterweight title. 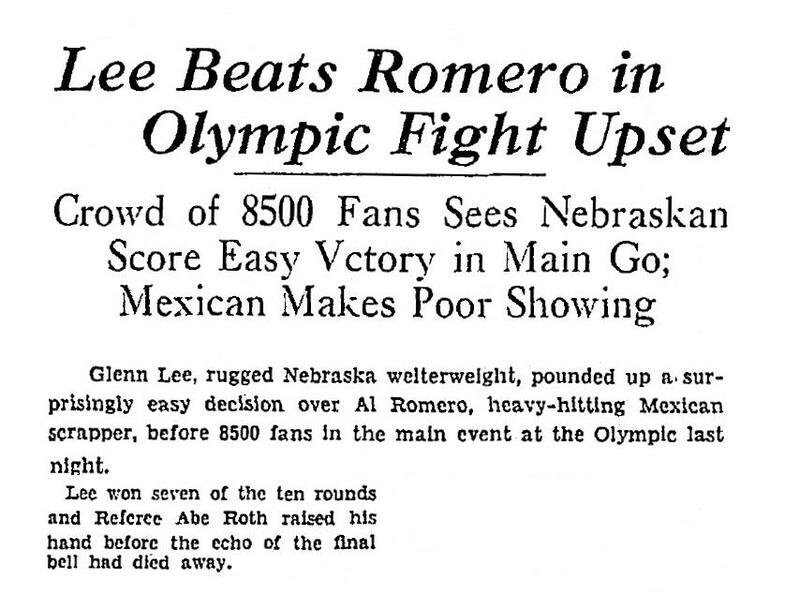 But Lee easily defeated Romero in front of 8,500 fans at the Olympic Auditorium on Feb. 18, 1936, winning seven of the 10 rounds. Romero, according to the Times report, "put up a poor showing and did not appear to be trying his hardest. Romero won the first and second rounds and had a shade in the seventh, but most of the rest of the evening did not attempt to force the fighting and his timing was away off. ... Lee scored repeatedly with overhand rights and a two-fisted body attack. Romero's left eye was almost closed during the last three rounds as a result of Lee's overhand rights." After the fight, the state Boxing Commission suspended Romero for an indefinite period for not giving his best effort against Lee. Romero appealed the suspension, saying that he had learned just before the fight that his mother was seriously ill and that took his mind off the bout, but the suspension was upheld. So Romero went to Australia to fight for the rest of 1936. Before the second Berglund fight, Romero was considered an up-an-coming middleweight threat, with powerful punches from both hands, and championship aspirations. "Romero’s chief trouble," according to one sports columnist, "is that he only fights as well as he wants to instead of as well as he can." After the loss to Berglung, Romero didn't fight again for nearly a year. He was scheduled to return to the ring on May 31, 1938, in a rematch with Zorrita. If Romero won, he had an agreement to fight world middleweight champion Freddie "The Tacoma Assassin" Steele, who had a record of 125-3-11, the following month in Seattle, as a tune-up before Steele's title fight against Al Hostak. But Romero injured his right hand during training and dropped out of the fight. He was replaced at the last minute by Jack Rainwater, who lost to Zorrita on a TKO in the eighth round. 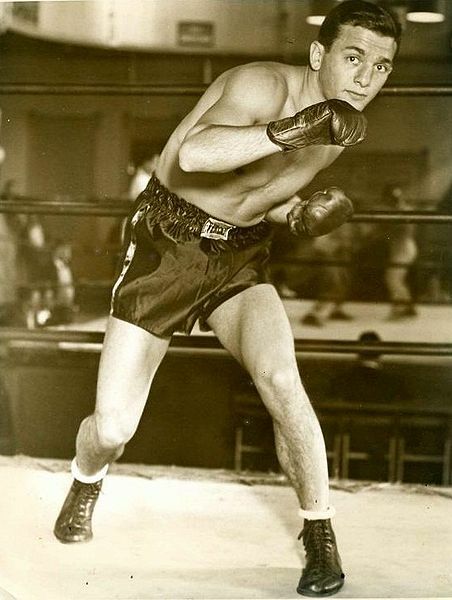 And so, instead of fighting Romero, Steele fought Hostak on July 26, 1938, in front of more than 35,000 fans, and was knocked out less than two minutes into the first round, which gave Hostak the middleweight championship title. Romero recovered enough to return to the ring on June 24 to fight Jack Rainwater, his replacement in the fight against Leon Zorrita. Romero defeated Rainwater with a sixth-round TKO. Eleven days later, Romero defeated Ray Vargas of Fresno, Calif., on points, and then, three days after that, defeated Rainwater again. If Lee wins again, it's likely he'll get the title fight against Hostak. But if Romero wins, he could be fighting for the middleweight crown. Romero staggered Lee in the first round with a right cross to the jaw, and stopped him with a right uppercut in the sixth and a right to the body in the seventh. But Lee did not go down, and Romero was not able to finish him off. Lee responded in the late rounds with a powerful series of body blows. At the end of the 10-round fight, the referee called it a draw. The Times called it an "atrocious decision," and a "gift" for Romero. Romero fought a relative newcomer, Milo Theodorescu of Romania, in his next two bouts, in December 1938 and January 1939. In both fights, Romero easily won the 10-round decision. On Feb. 21, 1939, Romero entered the ring against Young Peter Jackson in what was touted as another important step for Romero to be considered a top middleweight contender. Jackson typically fought in the lightweight class, and Romero outweighed him by more than 10 pounds. The fighters were even until the eighth round when Jackson opened a cut over Romero's right eye and the referee stopped the fight, giving Jackson a TKO victory. Two months later, Romero fought a rematch against Ceferino Garcia. Garcia started strong, winning the early rounds but, despite knocking Romero down three times, he couldn't put him away. Finally, Garcia opened a deep cut over Romero's right eye, and the fight was stopped in the eighth round. Romero and Garcia were scheduled for a rematch in July 1939, but that fight never took place. Instead, the 27-year-old Romero quietly retired from boxing. On March 26, 1941, a few months before his 30th birthday, Romero enlisted in the Army. He listed his occupation as electrician, and said he had attended high school for three years. His height was 5-foot-6, and his weight was 192 -- 35 pounds more than he weighed when he fought Garcia two years earlier. He served nearly five years, and was released on Jan. 16, 1946. Romero was living in Alhambra, Calif., at the time of his death in 1985, a few weeks after his 74th birthday. He was buried at Calvary Cemetery in Los Angeles. Throughout his boxing career, Romero was dogged by the questions, "What if?" and "Why not?" He never won an Olympic medal, and he never fought for a world championship. But his grave marker features a title that he earned, and that can never be taken from him – Olympian.